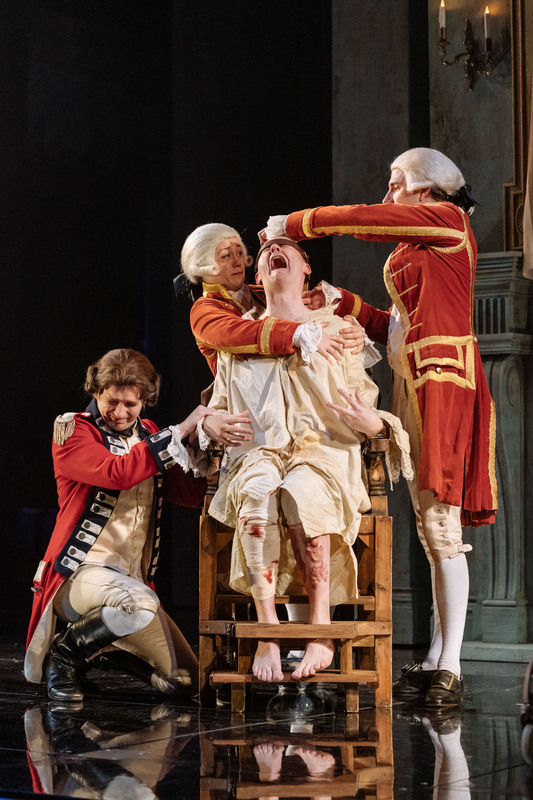 Review: The Madness of George III. Nottingham Playhouse – East Midlands Theatre. 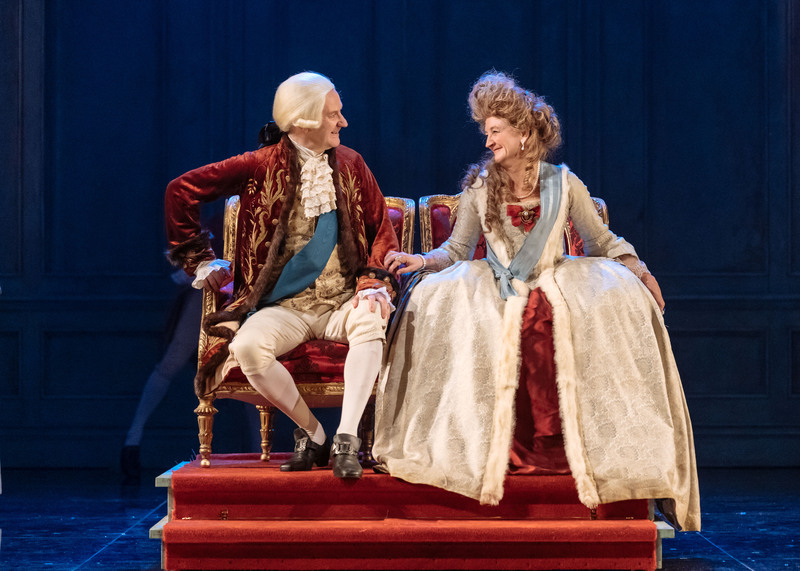 This Nottingham Playhouse production of Alan Bennett’s The Madness of George III is – an insanely good, king sized, right royal success. 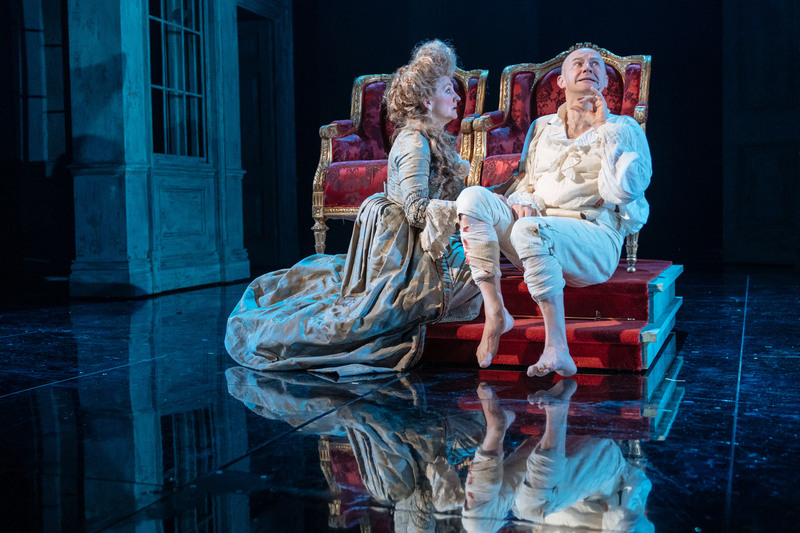 Directed with sensitivity, creative flare and a good deal of humour by artistic director Adam Penford, this period drama has to be the theatrical highlight for Nottingham Playhouse in a year of production excellence. 2018 sees Nottingham Playhouse celebrating 70 years of theatre making. 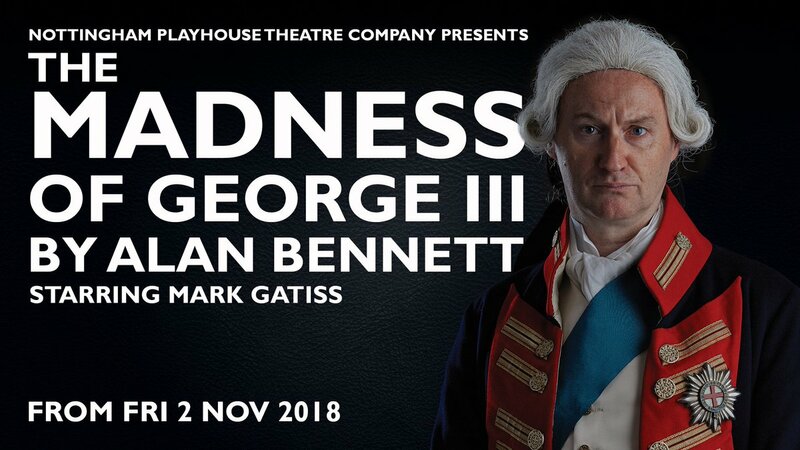 Penford has assembled a superb ensemble of actors for The Madness of George III and his casting has some interesting gender swapping going on – all to the theatrical benefit of the piece and the obvious audience enjoyment. 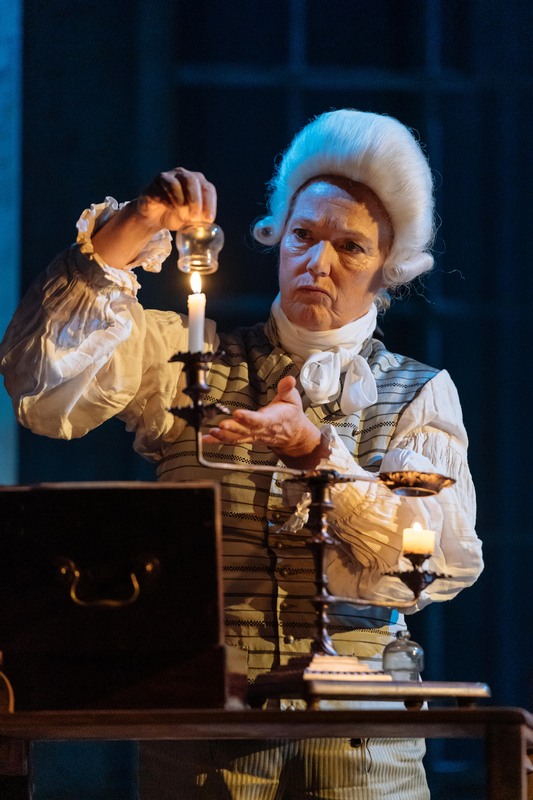 Amanda Hadingue becomes Fox/Dr Pepys, Stephanie Jacob plays Dr Baker/Sheridan, Nadia Albina is Fitzroy, Louise Jameson takes on Dr Warren and Jessica Temple adds much to the royally fond and sympathetic page character, Papandiek. In fact in The Stage newspaper (Nov 1st) Lyn Gardner has her column headline reading: Gender-swapping keeps theatre alive, relevant and exciting. How beautifully apt and pertinent to Penford’s work and this brilliant production. Equally, and just as important, is that, on our national and regional stages were are now starting to see many more artists of colour in prominent roles. 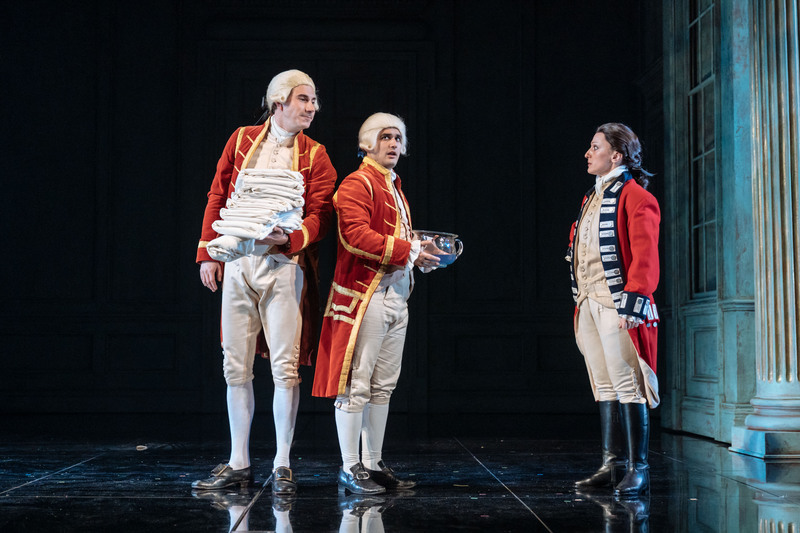 If one may bastardise a common theatrical phrase “They’ll be all white on the night” middle class blanket Caucasian casting is rapidly going out of fashion regarding choice of diversity and our theatrical experiences are much better for it. 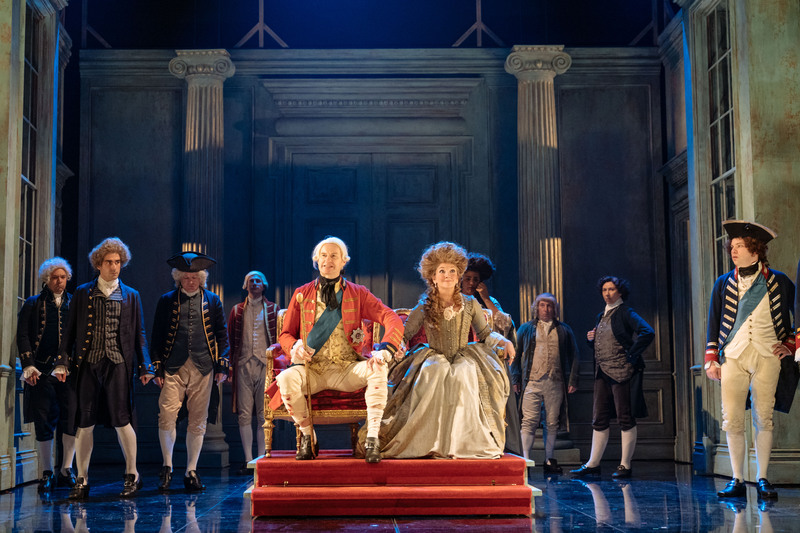 The admirable cast is seventeen strong with Mark Gatiss in the lead role as King George III. 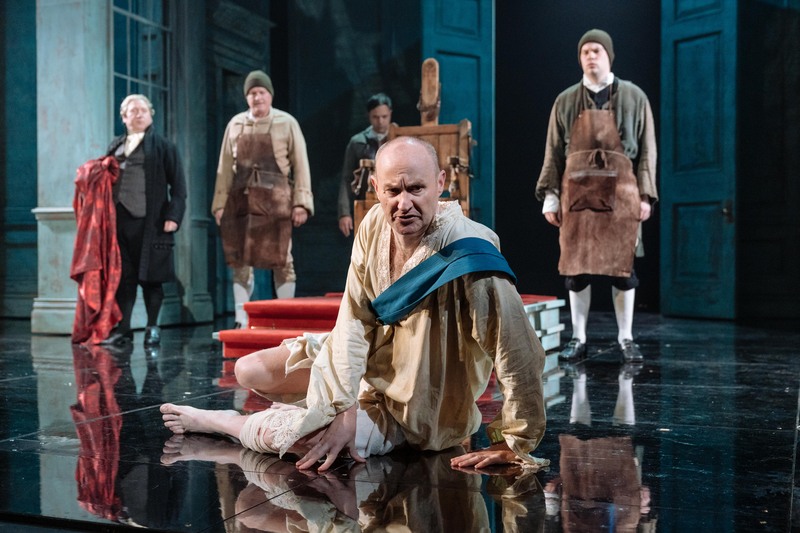 Gatiss is supremely good and ideally cast and applies his enviable talents for comedy and pathos to realise the damaged King, particularly on his journey into seemingly irrevocable madness. The King’s disordered discourse and idiosyncratic utterances, through Bennett’s clever structuring, are established in the audience’s minds from the off and make sense, if sense be the right word, of the more rapid royal ramblings as he starts to go off the proverbial rails. In his play script introduction, Alan Bennett explains that politically in 1788 any kind of discourse with royalty was a precarious thing to engage in. Bennett says “Dr Willis has to tread warily because behaviour which in an ordinary person would be considered unbalanced (talking of oneself in the third person for instance) is perfectly normal in the monarch.” He goes on to say that George’s elaborate circumlocutions are very characteristic of schizophrenic speech. The doctors of the late 1700s, seem by modern day standards, to have more quackery about them than a flock of overly loud and rather cold-blooded ducks. To attempt to cure the sovereign they scurry about practising barbaric blisterings of the royal body and head, declare that ‘gouty humour’ has settled on the brain, suggest and proffer emetics which cause him massive attacks of chronic diarrhoea, and then attempt to remedy that by offering constipating doses of laudanum. And then there is the practice of bleeding the patient. These 18th Century medical applications are less what we’d call medicinal and more like torture. 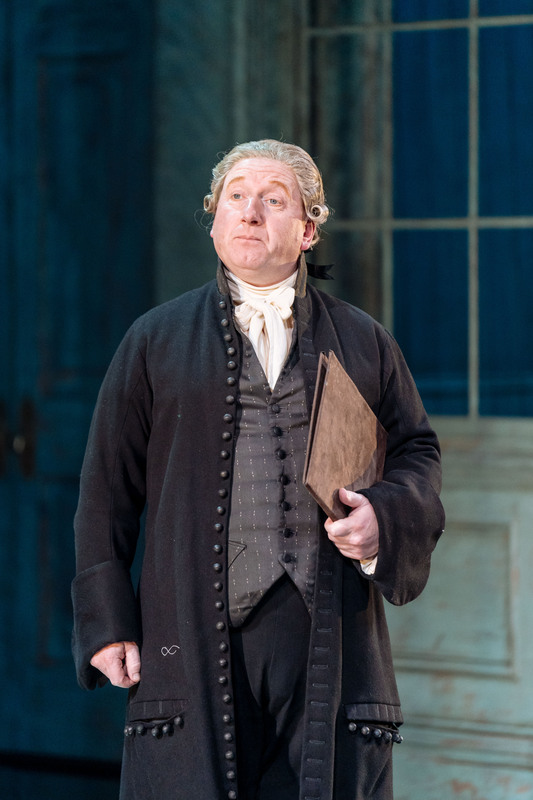 It is a huge relief when a Lincolnshire asylum owner called Dr Willis (given an excellent performance by Adrian Scarborough) is summoned to court to ‘cure’ the King with much more agreeable forward thinking methods of what we would now call a psychiatric science. The theatrical conceit and the deeply challenging relationship between this strong willed farming doctor and his mad majesty the King is where the play works best. Controlling human, meets and tests, the ultimate, out of control, royal controller. 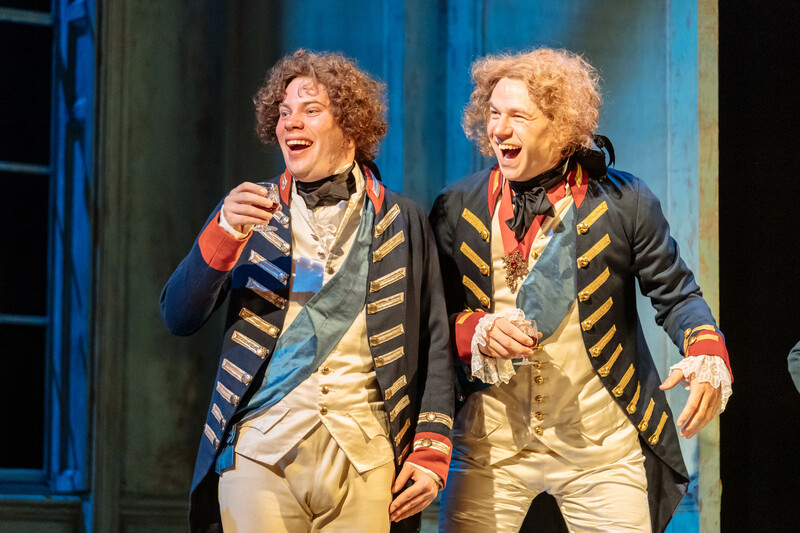 Both Gatiss and Scarborough are supremely good in their roles and bring some very affecting and moving drama to the Nottingham Playhouse main stage. In its bleak depiction of roles and status reversed there is revealed many a moment of dark comedy. Bennett also loves to show royalty as particularly human with human needs for love. The true love of George’s life is the woman to whom he endearingly gives the private title – Mrs King. In reality she is Queen Charlotte and played here with sensitivity and charm by Debra Gillett. The scenes where Queen Charlotte is forcefully separated from King George are heart breakingly well done. 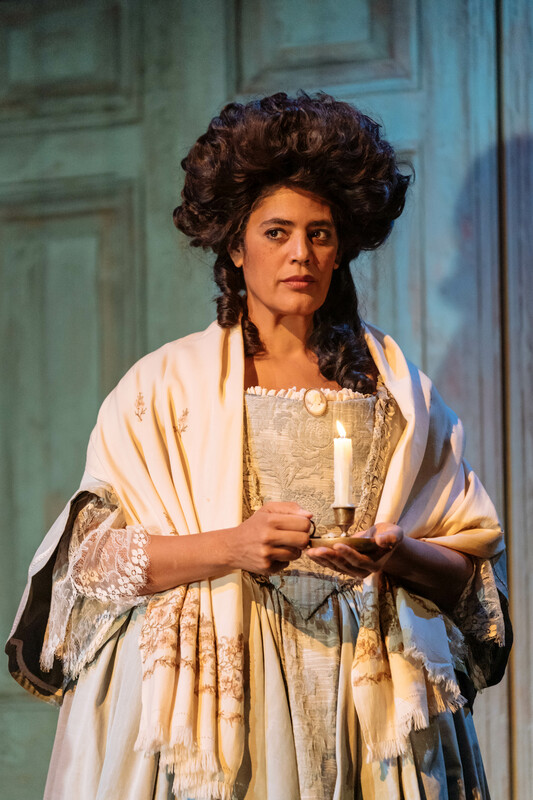 As the alleged ‘other mistress’ to the King, Sara Powell puts in a royally discreet and striking performance as Lady Pembroke. With the monarch in a dire state of major illness the real dilemma is the survival of the Tory/Whig government. This is because that in 1788 the monarch was still the engine of the nation. The King would choose, as his chief minister, a politician who could muster enough support in the House of Commons to give him a majority. 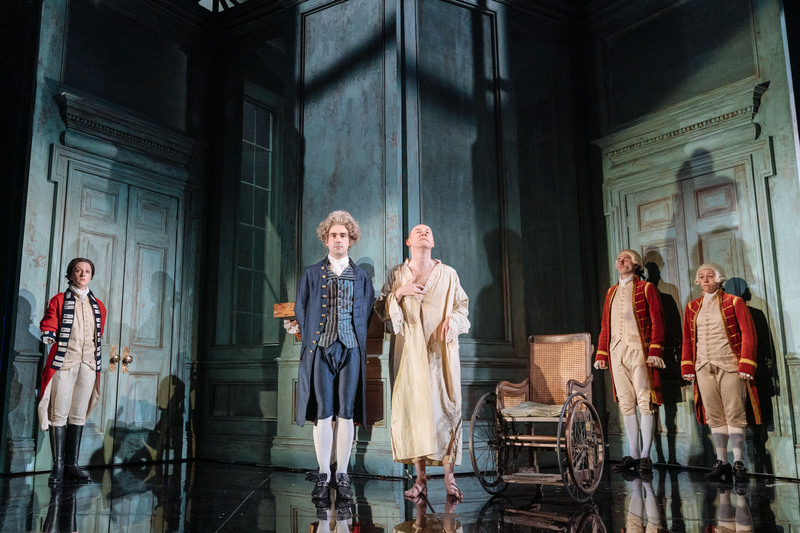 In Bennett’s brilliant play we discover, and give a wry smile at, that much in the actions and behaviour of late 18th Century British politics and ambitiously scheming politicians, has clear parallels with today’s political machinations. Waiting impatiently, in the royal wings for the rights to royal accession to be passed, is the figure of The Prince of Wales played with gusto by Wilf Scolding. He has been waiting all his life to be monarch and Bennett claims that the real life Prince was more of a genial character than he, as playwright, has presented him to be. Also, The Prince of Wales was much more reluctant to have it admitted in public, or in the press, that his father might be mad. For the sake of antipathy between father and son Bennett has painted The Prince of Wales in less sympathetic colours with the Queen calling her son an oversized turbot and ruing the day he was born. George too has some strong opinions about his grandiose furniture lover and portly over indulgent son. 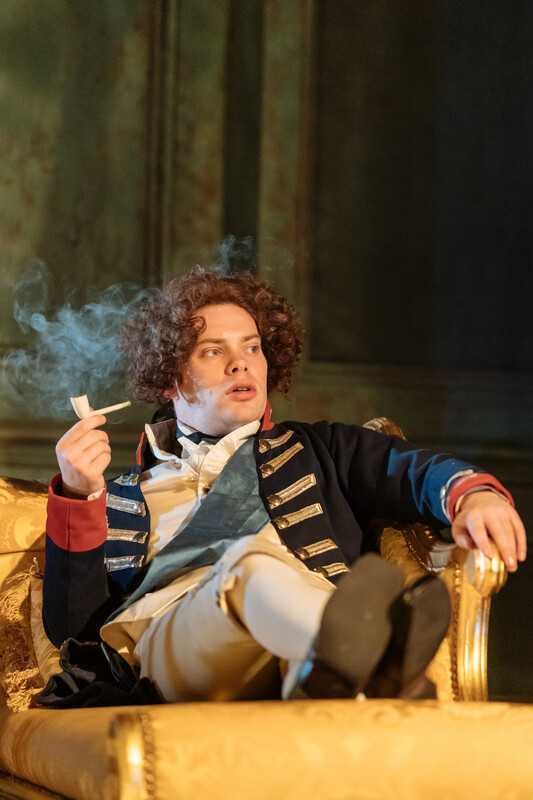 Completing the cast are Jack Holden (Greville), David Hounslow (Thurlow), Andrew Joshi (Dundas), Adam Karim (Fortnum), Harry Kershaw (Duke of York) and Billy Postlethwaite as Braun. 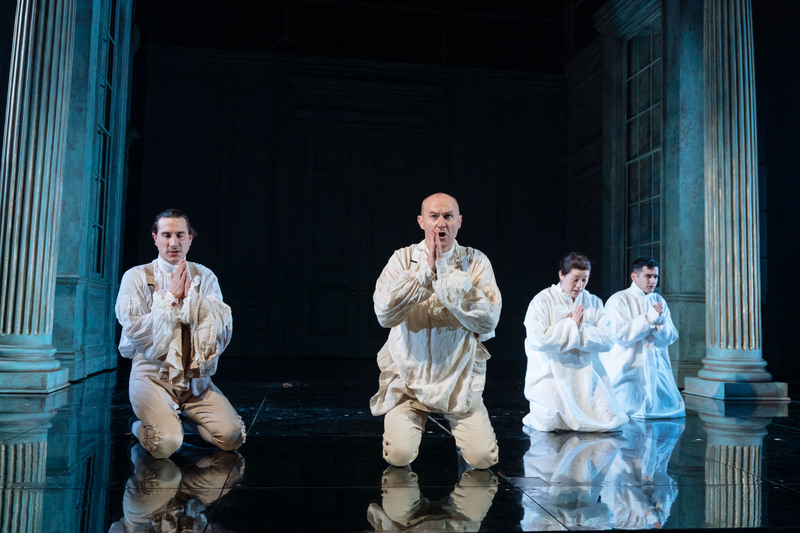 Their combined performances add much deliciously meaty weight to this essential story on the overriding theme of loss and of Britain potentially on the verge of the collapse of the monarchy and all that would entail in Georgian Britain and beyond. Designer Robert Jones revolving Verdigris infused set taps into the theatricality of royalty and cleverly brings out the theme of appearance versus reality. It is cleverly multi- locational and multi-dimensioned. 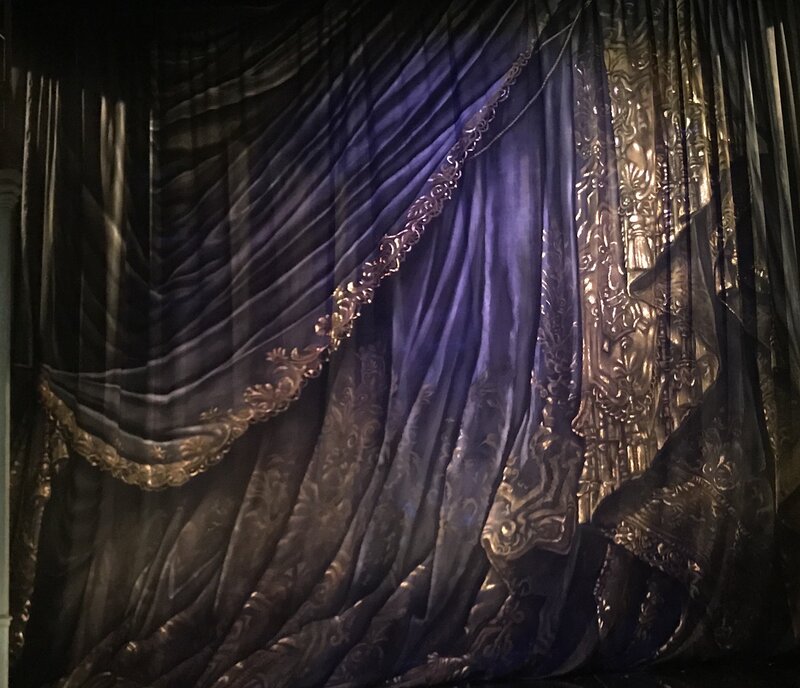 The front cloth is painted to look like a lavish fabric curtain and there is very much a deeply satisfying theatrical nature to the way the set indicates the fractured mind of the King. As Adam Penford says in the programme, “A lot of the walls aren’t solid. They are made of gauze. 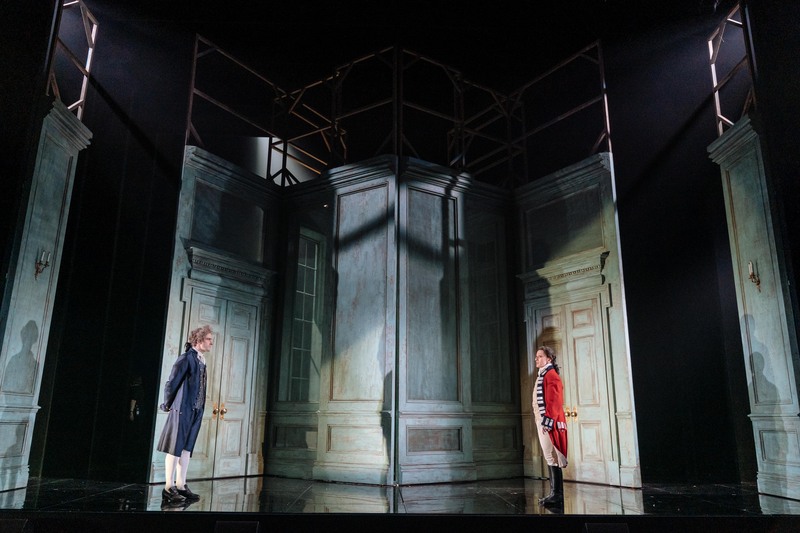 This transparency allows us to give a sense of the royals living in the spotlight, with silhouettes constantly walking up corridors behind walls and people listening behind doors and spying through keyholes.” Richard Howell’s brilliant lighting design is a glistening jewel in the crown of this production of The Madness of George III and Tom Gibbons sound design is exemplary. 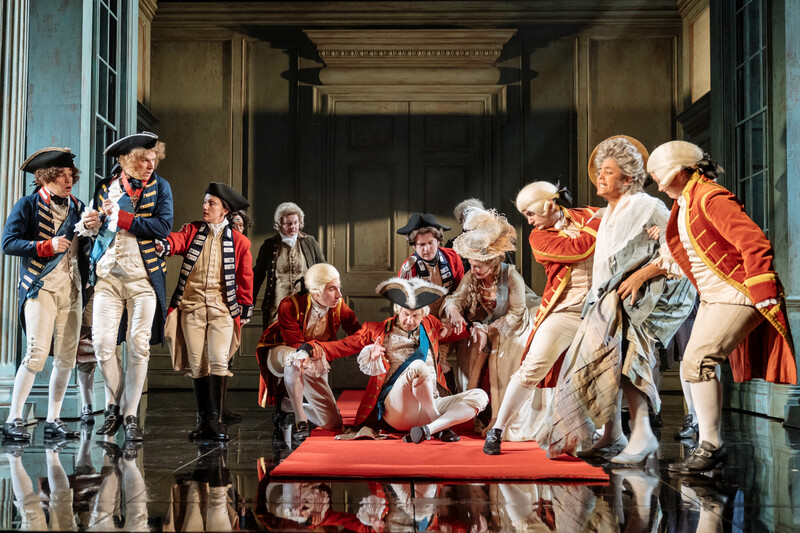 The Madness of George III is also to be broadcast in cinemas UK and Worldwide by National Theatre Live on Tuesday 20th November 2018. To find out more about reviewer Phil Lowe please click image. Phi Lowe is a member of UK Theatre. 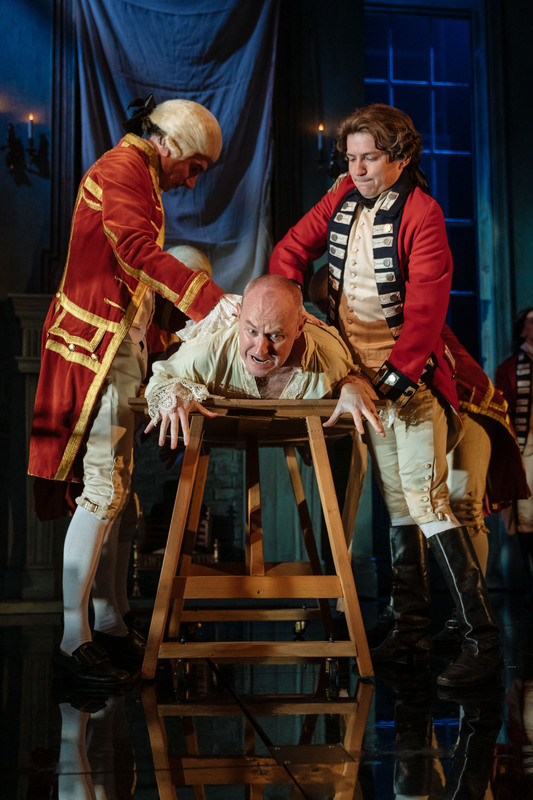 I’ve just seen the excellent production of The Madness of George III as relayed to my local cinema. Fantastic performances all round, particularly Mr Gatiss and Mr Scarborough. Ms Gillett portrayed the Queen beautifully too. The sets, costumes and musical choices were inspired. I have to say I found the gender swapping a bit OTT. So many females playing males, it almost became farcical. It was a patriarchal world and masculine energy was paramount – hence the need to keep the king’s ‘weakness’ a secret. The cast were all excellent but I felt patronised by having so many females in unsuitable roles. Would it happen in reverse with male actors portraying women? I hardly think so.